Former President George W. Bush, who took up painting after leaving the White House, is putting on display some of the portraits of world leaders he has painted. 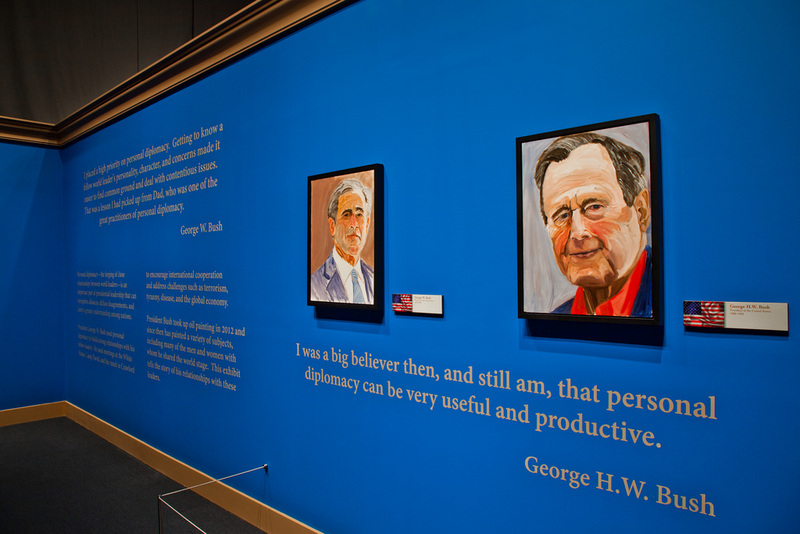 The works of art, shown in an exhibit at the George W. Bush Presidential Library and Museum, give insight into the relationships Mr. Bush had with the likes of Russian President Vladimir Putin and former British Prime Minister Tony Blair. "I think I told Tony I was painting him, and he brushed it off so to speak," Mr. Bush said in an interview with his daughter, Jenna Bush Hager, for NBC. He clarified to his daughter, "That was an art pun." Mr. Bush said the painting of Blair "conveys a compassionate person and a strong person and a reliable friend." The painting of Putin, Mr. Bush said, was intended to reflect the Russian leader's competitive nature. "Vladimir's a person who in many ways views the U.S. as an enemy," he said. "And although he wouldn't say that, I felt that he viewed the world as either the U.S. benefits and Russia loses, or visa versa. I, of course, tried to dispel him of that notion." When Putin met Mr. Bush's beloved Scottish Terrier Barney, the former president recalled, "Putin kind of dissed him, like, 'You really call that a dog?'" A year later in Moscow, Putin introduced Mr. Bush to his hound. Mr. Bush recalled Putin saying, "Bigger, stronger and faster than Barney." Mr. Bush also painted his father, former President George H.W. Bush. "I tried to convey a sense of strength and kindness" in that painting, he said. He also commented on his self portrait: "This is an improvement from the first one I did of myself, the one that makes me look like Alfred E. Neuman," Mr. Bush said, referring to cartoon character on the cover of Mad magazine.